He's a Republican, for starters. He describes himself as "older than dirt." And he makes no apology for an Iraq war that is especially unpopular on college campuses. Doesn't sound like a recipe for winning the hearts of young voters. And yet John McCain has vowed to make a serious play for the 18- to 29-year-old crowd that's often identified with "Obama-mania." Could the 71-year-old grandfather possibly have a shot? Several polls, including a recent AP-Ipsos survey, show Democrats Barack Obama and Hillary Rodham Clinton faring far better with that age bracket when pitted individually against McCain. But in the last month or so, there've been blips in McCain's favor. One recent AP-Yahoo News poll found that 38 percent of 18- to 29-year-olds supported McCain, while 37 percent were for Obama. When pitted against Clinton, it was McCain 43 percent, Clinton 28 percent. The margin of error was plus or minus 4.9 percentage points. The varying outcomes may indicate the difficulty pollsters have in getting a good sample of youth, particularly when many have cell phones and no land lines. Some political scientists also note that young voters have historically been among the most "fickle" or "soft" - more willing than some to change their minds right up to the election. Either way, McCain is seizing the opportunity to challenge the Democrats for a group that hasn't gone strongly Republican since the Ronald Reagan era. 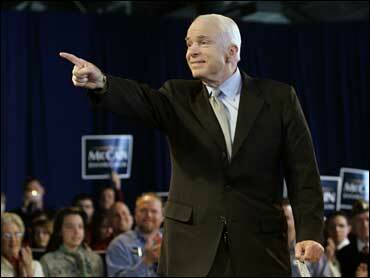 So far, one political analyst says, McCain has managed to avoid looking like he's trying too hard to be hip. "He's not going to blow the saxophone on MTV or talk about boxers or briefs," says Christopher Malone, an associate professor of political science at Pace University in New York. "But that's part of the allure. There's a real dignity about him in terms of his patriotism and war record." It means that McCain has unapologetically stuck to his support for the Iraq war, even if it's unpopular, says Joe Pounder, a McCain campaign spokesman. But he's also been willing to take on issues not necessarily associated with Republicans. Those include global warming, a top concern for many young voters. That reputation for standing tough has resonated with some young people. Zach Bennett, a freshman at Davidson College in North Carolina, says he admires McCain for being "honest and rebellious." So does Matt Woods, a 26-year-old financial analyst from Tampa, Fla.
"I like to consider him a fiery little fellow," says Woods, a former chairman of the student Republican group at the University of Tampa who now considers himself "more conservative than Republican." Though he doesn't agree with McCain's stance on the war, he says he trusts him enough to vote for him. "He seems to be a thorn in people's side, but in a good way," Woods says. The tough-guy war hero image might not appeal to everyone, though. And some election watchers wonder if McCain's reputation for having a temper might turn off some young voters. Chelsea Dodd, a 23-year-old Republican in Hoboken, N.J., recently met McCain. She concedes that he lacks the charisma of Obama, or even Clinton. But, she says, he still "holds a certain appearance of wisdom." So in that sense, she thinks his age works for him. "While I dislike how he reminds everyone he's a veteran in every speech and that he's not as personable as his rivals, he definitely has involved himself in enough international affairs to be better equipped to deal with them," says Dodd, who has family in the military, including a cousin who died in Iraq. Pounder, McCain's spokesman, says the campaign will grow its ranks of young Republican volunteers as the campaign heats up. The Obama campaign, too, is continuing its own outreach with a summer "fellows" program, enlisting thousands of students to work for the campaign. "No one should assume that young voters, older voters - voters of all backgrounds - are going to side with any one candidate," says Steve Hildebrand, Obama's deputy national campaign manager. "So we certainly don't feel any ownership over young voters." It also means they will take nothing for granted, even if Obama has already drawn young primary voters in large, sometimes unprecedented numbers. Such outcomes have some political pundits wondering if McCain has any real chance of winning over young voters. "He should not concede these voters, but he can't count on making big headway with them," says Steven Schier, a political scientist at Carleton College in Minnesota. He says McCain's age and the overall "unpopularity of the GOP" with young voters will be difficult to overcome. And even some young Republicans are doubtful. "Frankly, I don't have much faith in the majority of this country's young voters," says Laura Loffredo, who's 19 and a member of the Republican Campaign Committee at Babson College in Massachusetts. "As much as I support McCain for president, unfortunately, I don't believe its very realistic that a significant amount of young voters - particularly college students - will be persuaded into rethinking their choice of candidate." Time will tell, says Malone at Pace University. But he gives McCain credit for trying. "You got to hand it to him - at least at the initial part of his campaign, he has certainly not gone to his base to shore that up," Malone says, noting the Arizona senator's recent trips to New Orleans and other struggling regions of the country. "My sense is that he's going to use the next month or so continuing to appeal to the groups Republicans have written off."